Sometimes, just a bit more contour to certain facial features can have a positive impact on the entire aesthetic facial appearance. 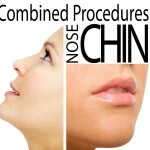 Chin implants can improve balance and definition in the chin while helping offset the appearance of a prominent nose. With chin augmentation, Dr. Ali Sepehr can help you attain your goals in a procedure that requires minimal recovery time. Facial implants come in a variety of materials depending on the target area. While the facial dimensions in men and women are often quite different, Dr. Sepehr can optimize the procedure to augment the area of concern in a manner that enhances an individual’s masculine or feminine features. After an extensive examination of your facial anatomy, a personalized treatment plan that accounts for your unique needs can be created to ensure the desired contour is achieved. In addition to improving the contours and appearance of a recessed chin, chin implants can provide better aesthetic balance for patients who have a prominent nose. The implants themselves are made of a silicone elastomer, and are placed in front of the jawbone through an incision made inside the mouth or underneath the chin. The entire procedure can be performed in less than an hour as an outpatient. Chin augmentation can be performed as an individual procedure, or it can serve as a complement to rhinoplasty or other aesthetic enhancement options for a more complete makeover. Patients who undergo surgery for facial implants can expect some degree of swelling during the first week after the procedure; however, this should fade quickly and any discomfort can typically be controlled with medication. Specific post-operative recovery information is dependent on both the area of treatment and the details of your treatment plan. Dr. Sepehr will provide after-care instructions personal to your procedure at the time of operation. In general, you may experience some difficulty talking and smiling for a few days after surgery, but this is only temporary. Many patients can resume normal daily activities within the first week; however, you should plan for at least one to two days of downtime. If you would like more information on facial implants, please contact The OC Center for Facial Plastic Surgery. Where can facial implants be placed? The most popular places for facial implants include features that may lack a natural angle, or areas that tend to lose volume or definition through the natural aging process. Patients typically desire chin enhancement most frequently, as it can enhance facial symmetry in a weak or undefined chin and jawline. Am I a candidate for facial implants? Ideal candidates for facial implants are in relatively good health and are seeking long-lasting cosmetic enhancement. Individuals who smoke may not be good candidates for the procedure. Those with very little chin projection typically benefit greatly from facial implants. While this procedure can enhance the shape of the face and restore missing definition from certain features, it generally does not provide notable enhancement for skin laxity or facial wrinkling. Patients who wish to rejuvenate their appearance by smoothing fine lines and tightening sagging facial skin may be better served by a facelift, which can usually be performed in conjunction with facial implants. During your consultation, Dr. Sepehr will listen to your aesthetic concerns and help determine whether facial implants would fulfill your surgical goals. Are there any non-surgical alternatives to facial implants? Those who are seeking temporary cosmetic enhancement or minimally invasive augmentation may find a solution to their concerns in the range of non-surgical treatments offered by Dr. Sepehr. With a liquid facelift, individuals can improve the appearance of wrinkles and creases while adding volume to the lips, cheeks, and other areas, depending on their unique needs. Additionally, an array of cosmetic injectable and dermal filler treatments—including JUVÉDERM VOLUMA™ XC and JUVÉDERM VOLBELLA®—are designed to enhance volume in the mid-face and lips for contouring that requires no anesthesia, stitches, or downtime. When you meet Dr. Sepehr for your initial consultation, he can present various treatment options to you based on your desired aesthetic result.